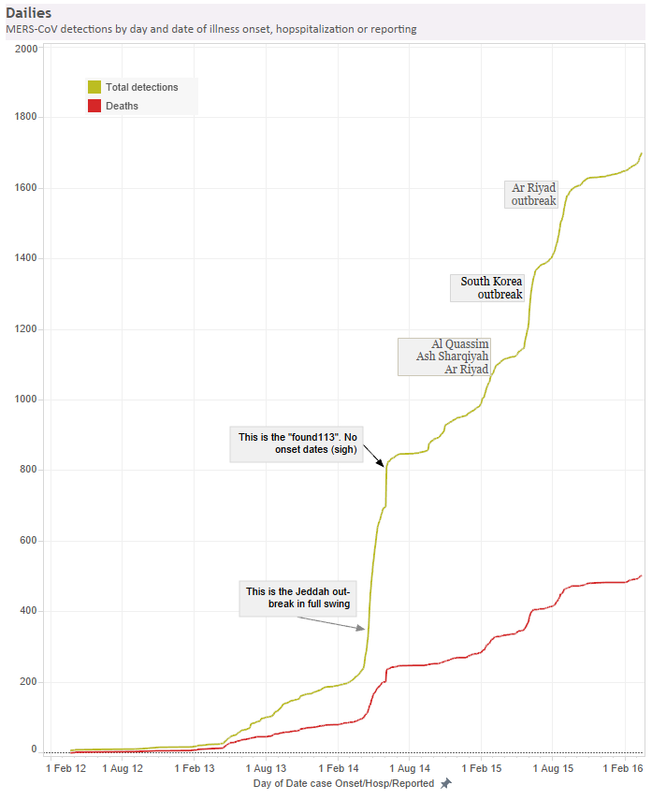 The next wave of MERS-CoV cases is well underway in the Kingdom of Saudi Arabia (KSA). Since 2012, 1,702 MERS-CoV detections have been reported in humans from 26 countries around the world. The first reported MERS cases appeared on our radar via an eMail to ProMED sent September 20th 2012. That person became ill in April 2012 and some others, found later, were ill in March 2012  - so we're smack dab into our 4th "disease onset birthday" right now. 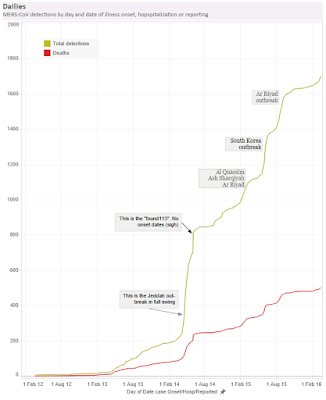 Each year we news and number watchers, wonder aloud about the course that MERS-CoV might plot. We don't predict it though - that would be dumb. No-one can know where things may go because that's all based on human behaviours, oversights and mistakes. And who knows how, how many, how often, why or when those will occur? MERS-CoV is very much a human problem - it's a particularly opportunistic virus which causes it's biggest impact when we create the conditions for it to spread among vulnerable people in health care settings. Whether or not that whole process will play out again in 2016 is anyone's guess. As I noted in my last post, it has already happened to some degree in Buraidah in the Al Quassim province of KSA. The KSA is - if you are new to MERS-CoV - the country in which 80.4% of infection have been acquired. Word oen the Tweet is that the outbreak is under control now. @HelenBranswell Because I am closely following the situation as general director of IPC. No evidence of transmission for several days. I've updated my graphs, tallies and charts with the latest numbers now, so feel free to click on the MERS-CoV tab above to see where we're at. And don't forget - an outbreak of an infectious disease in one country has the potential to be an outbreak in any country. Just add human behaviour.